If you have a 2012 or newer model, please call me or E-Mail me before you order. Please click on Video to see how well this kit works! 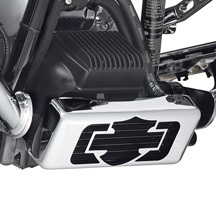 Harley oil coolers are great to have when you want to prevent your engine from over heating. 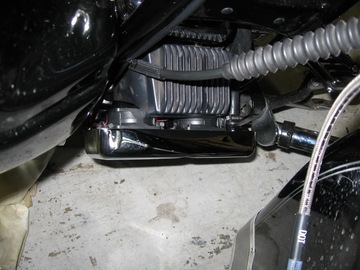 Unfortunately, the only way to cool the oil circulating in your oil cooler, is to have a steady flow of air, flowing through it while your driving, at a steady speed. If your in heavy traffic or moving slow, air is not flowing through your oil cooler, so the oil cooler is not doing much to cool your oil. The solution to that problem, is to put fans on the oil cooler. Simply flip the switch to turn on the fans, so that they circulate the air when you are moving slow or stopped. These are NOT PC FANS. These were specifically deigned for outside use in all kinds of weather condition. They are WATER and DUST PROOF. Riding in the rain is not a problem. 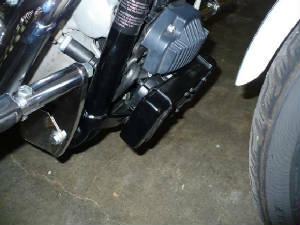 The fans are 2 1/4 inches square and 1 inch deep and will fit behind just about any oil cooler out there. These fans are powerfull, use only 0.23 amps and put out a lot of air. 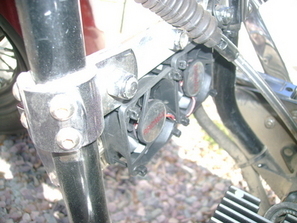 YOU MUST SUPPLY YOUR OWN OIL COOLER. These fans have the IP54 rating and are designed to perform in environments subject to a wide variety of dust, moisture, and direct water exposure. Potential applications include use in outdoor security cameras, control equipment, medical equipment and emergency vehicles, field and ground support equipment and indoor/outdoor cooling applications where dirt, grime, water and high-humidity extremes exist. Before ordering, please make sure you have at least 1 inch of clearance between your cooler and frame/voltage regulator. Free Shipping in the U.S. Please E-Mail for shipping quote outside the US.